I have been busy this week tackling my big spring cleaning project. In my last post I talked about my challenge to get rid of 40 bags worth of clutter in 40 days, leading up to Easter, so far the project has been going very well, and 12 very full bags have gone out the door. It is amazing what a small closet can hold! I went through and did a second look through my closet and decided to purge even more unwanted clothing, and shoes and came up with quite a bit more. Even after I packed away some of my heavier winter wear for the year, I have found my self thinking I should open up that box and rid it of a few more items. It really pays to go back through an area a couple of times, the space it clears up is invigorating, my closet is so much easier to look through now! 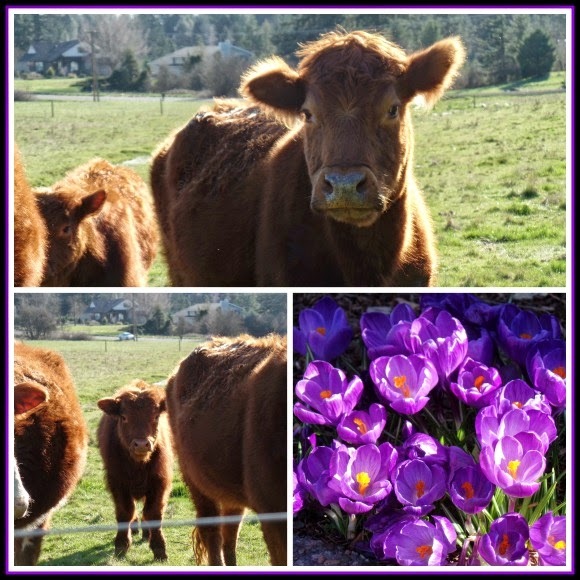 We had a few days of rain but now our early bright spring weather is back, and it is so enjoyable. The flowers are blooming everywhere! Every year the ornamental plum tree in my front yard puts out the most pretty pink blossoms, it has become a yearly tradition of mine to go out and take pictures of its blossoms every year. 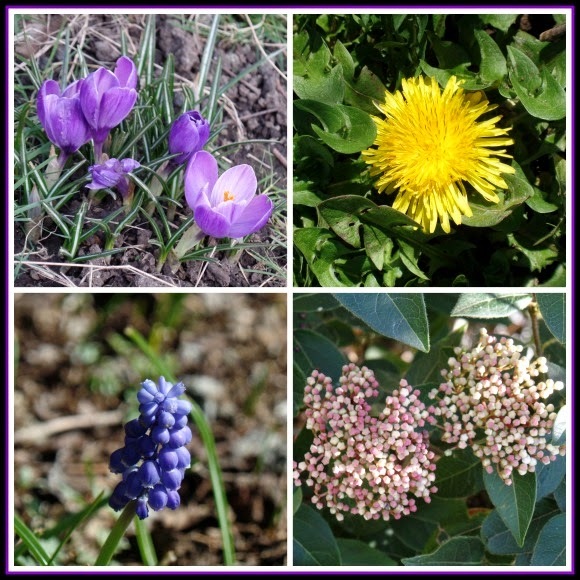 The crocus and grape hyacinth are popping up around the base of trees, the shrubs are starting to bloom, and I even spotted a very early dandelion! With all this warm weather we've been having, I think it would be wise to get out and do some early weeding this week or we may be overrun by the end of March! 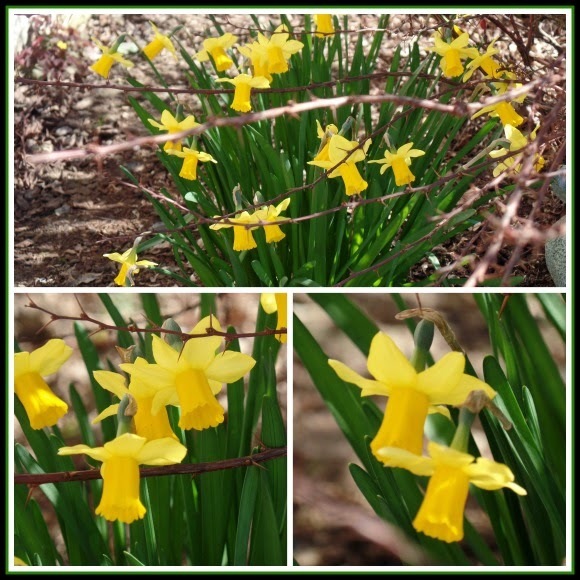 My little patch of narcissus is peeking out from under the still bare and thorny barberry, I think it looks pretty peeking out from the thorny twigs. I wanted to share a quick recipe here as well. Since I have been so busy with spring cleaning, as well as multiple activities with the kids, when it came time to prepare food for our most recent church brunch potluck, I needed something quick and easy. We live about twenty minutes from our church and I am not a morning person, so the prospect of getting up before dawn to prepare food was not something I was prepared to do. At the same time, I really wanted to bring something yummy to the potluck. 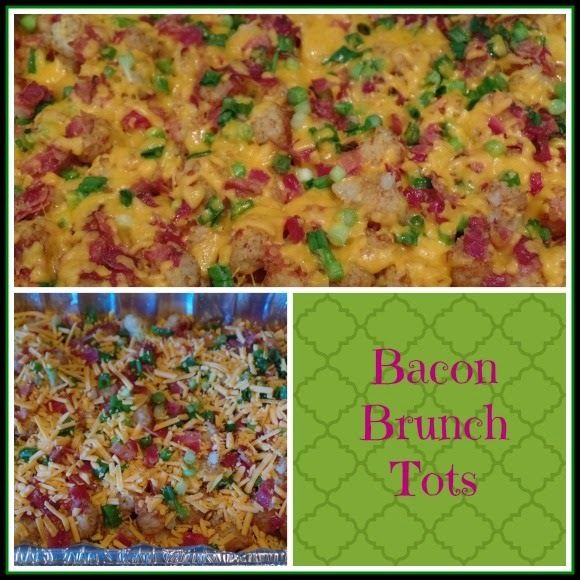 So I came up with a very easy recipe- Bacon Brunch Tots! I got up and baked a large tray of tater tots- one of the big extra large bags, when they were cooked through and nice and crisp, I took them out of the oven, and put half of them in the bottom of an aluminum lasagna sized pan. Then I topped the first layer with shredded cheddar cheese, half of a bunch of cleaned and chopped green onions, and half a pack of chopped cooked bacon. I used a package of precooked bacon, which they sell by the bacon, because I didn't have time to cook up bacon that morning, you could cook up the bacon the night before though and have it ready to go for the morning. Then add the second half of the tots to the pan and top with more cheese, the rest of the green onions and bacon. Cover the pan with foil and return to the oven and cook for about 10-15 minutes until the cheese has melted. This was a yummy and quick brunch dish that I will definitely make again! One of my funnest home organizing projects that I am currently doing this spring is organizing my DVDs. I have quite a few DVDs and most of them I want to keep, however, I was starting to run out of room for them all, and I really didn't want to buy another DVD cabinet because that would crowd the living room. So I had to come up with a way to store my growing DVD collection in the same amount of space. 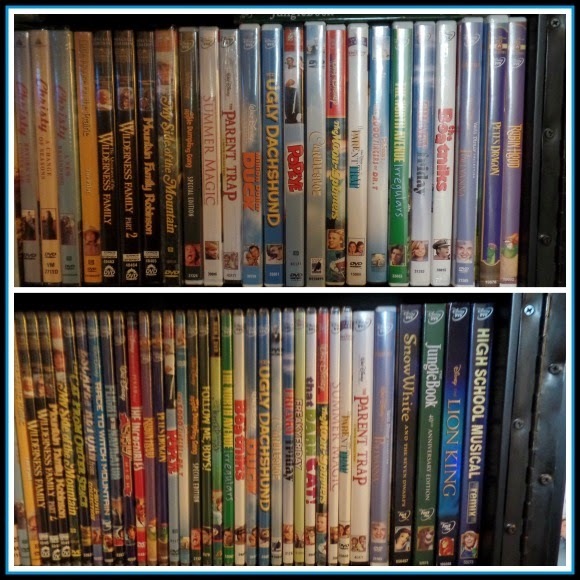 At first I thought I would use one of the notebook storage systems like I did years ago for my CDs, but I like to bring my DVDs with on vacation and they tend to sit out while they are being watched or I may want to lend them out and so I didn't want to get rid of the cases. I found myself wishing that all DVDs were sold in slim DVD cases, then I wondered if they sold packs of slim DVD cases, and indeed they do! I went to Amazon and bought a few 25 packs of clear slim DVD cases to get started. 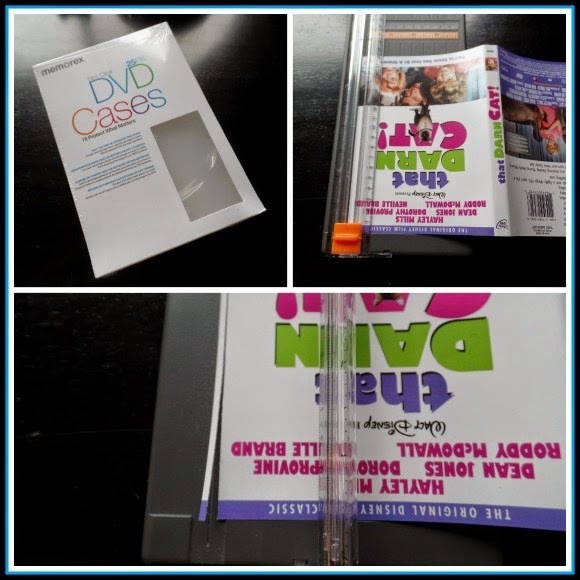 The clear cases have a plastic sleeve on the cover to hold the DVD paper, but since it is a bit smaller I found it worked best when I trimmed each DVD cover by a thin slice on each side. I used my paper cutter to cut a nice clean edge, you can see from the picture above it is only like two millimeters off the front and the back edge. You can see up above in the picture of two DVD shelves, one before it was slim packed, and the other that I had switched the majority of the DVDs into slim cases. The slim packs allow you to shelf slightly more than double the DVDs in the same space! I am only transferring standard DVDs into the slim cases, any DVD that is in a special case like the pretty foil box that covers some of the Disney princess movies, or special multi-DVD sets or anniversary editions I am leaving those in their original cases. This has definitely solved my DVD storage problem, at least for the time being! With Netflix and Amazon Prime I find I don't purchase as many movies these days, but there are still those movies that I just love and really enjoy having on DVD. This next week I have even more spring cleaning and organizing goals! I am re-configuring my office and dining room. Now that the kids are both young adults, I feel they need their own desk space in our office. Their room's are just too small for desks but they need space to study and work on their computers. Last night Gary and I cut out scaled down furniture shapes to represent desks and bookshelves and such and arranged them on a scaled down room size piece of paper until we came up with a good arrangement. So this week I will be reorganizing my bookshelves and making room for desks. I look forward to posting pictures of the finished product! Hi April! Boy! I just can't get over the difference between your weather and ours! The casserole looks so good. I'm sure the guys would love it. Now that's one potluck that I'd like to attend! I put all of my DVDs in cases, but there's sets that I keep in the original packaging to make sure they stay together. It looks like your slim cases would fit the bill for that. Nice to hear from you again! you have certainly been a busy bee. Wish Spring would show it's face here in Southern Ontario. 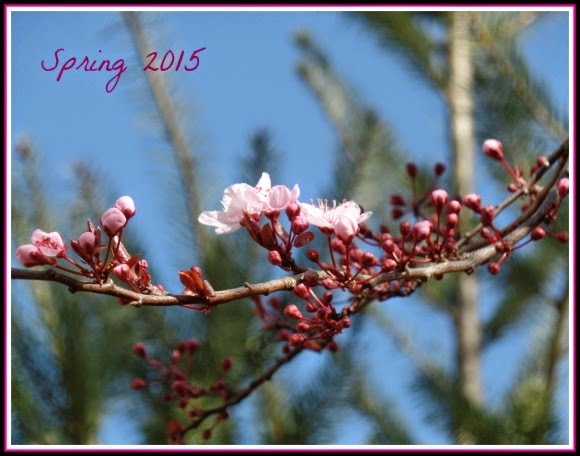 Spring is springing here in Wales ~ but your flowers are so pretty! Mine are still behind. I was in favour of clouding my dvd's until I heard of the possible future problems, so hard copies will be kept now. I must see if Amazon UK sells those smaller cases. Great tips! That I need lol!